One of the delightful things about writing a blog -- that no one EVER mentions -- is that people dig Googling themselves and following links to posts about themselves, so you can probably draw in people you've always wanted to meet by mentioning them a lot. (Michael Fassbender Michael Fassbender Michael Fassbender.) It's a bit like summoning up the Candyman by reciting his name into a mirror, but with a less bloody outcome. In this manner, even a weirdo little shack like this, stuck as it is out in one of the lonelier badland fringes of the worldwide web, will occasionally be visited by Greatness. The downside is that, once someone I've blogged about makes contact, I get struck with a case of Bad Housekeeping Nerves. "What did I say about that person? Was I polite? Was I too snarky? Was I too fawning? Did I spell their name correctly?" Every once in a while something happens that dashes once and for all the vicious rumor that Milwaukee is a provincial town. Monday night, when the esoteric Mideastern art of belly dancing came to the Crown Room at the top of the Pfister Hotel, was such a time. You might think that Milwaukee would not have a lot of Mideastern art aficionados. Oh, ye of little faith. Still, for those shut-ins who have not been exposed to this ancient art, I will try to relate as closely as possible the significance of the graceful movements of Juliana. I paid really close attention just for you folks. Actually, it is Juliana’s partner, Rafael, who appears first, wearing a black mirror suit and boots. He starts playing a little tune as a pile of veils starts floating across the floor. That is Juliana. As she glides across the floor she keeps looking from side to side for something. I hope she didn’t forget anything. She is getting a little agitated, whirling around. Whoops! I knew that was going to happen. She lost one of her veils. Well, she still has the green one left, thank goodness. Uh-oh. Now she has a headache. She is putting the back of her hand to her forehead. It seems as if she might have a problem with her stomach, too. It seems to be turning over. But she is still smiling. What a trouper. You know, it is probably all that whirling around that is doing it. That can affect you. It is sort of like riding the Turn of the Century at Great America. Now she is getting warm. She is opening up the back of her green veil, obviously trying to get a breath of air. Oh, now she’s done it! She dropped it. It is now that the deep religious significance of Juliana’s movements becomes obvious. As soon as she dropped her veil, a guy on the other side of the room inhaled deeply and uttered the name of a religious leader. I suppose I could say something about what remains of her costume, but not much. The top just covers the city ordinance. She seems to have really good muscle tone. Well, about time. Here comes old Rafael to give this poor girl a hand. He circles her a while, probably to check her over and see what her problem might be. Then they start moving around the floor and he helps support her once in a while. A word about the Marrakesh Express, the four man and many instrument band that accompanies the dancers. An opening set of international tunes has the crowd clapping happily in time, It is the kind of music that makes people want to smash their glasses on the floor. The talented group is made up of musicians from far away Israel, Philadelphia, New Jersey and Brooklyn. The show will continue at the Crown Room through Sept. 24. And, as promised, here is the splendour of Rafael and Juliana as filmed at Club 54. First up is Juliana solo, in those costumes that made her famous. Also - zagat! Here they are together. So. Awesome. The stage sets, the costumes, Rafael's entrance ... geeze Louise. I thought I was being pretty fancy-schmancy by getting fairy lights to decorate the pub for the Thamesis Hafla, but this backdrop is...is...boss. I wonder where it is now? My filthy gossip habit has paid off. Huzzah! Those are some pretty spectacular performances. In fact, all this showmanship has me thinking. That doesn't really look like belly dancing to me. That looks like modern dance mixed with flamenco, mixed with disco, mixed with bellydance, mixed with Las Vegas. Fusion without the Tribal. Now, since I am not a great dancer, I do everything I can to surround myself with great dancers so that might siphon off some of their awesomeness for my own gain. One tidbit of wisdom I picked up from a fusion dancer was this: When you are putting together choreography always keep in mind what it would look like you were performing said choreography in a black dance leotard to different (or no) music. Would it still look like belly dancing. I think that may be relevant here. My teacher that knew Juliana back in the day said she was without a doubt an accomplished dancer. 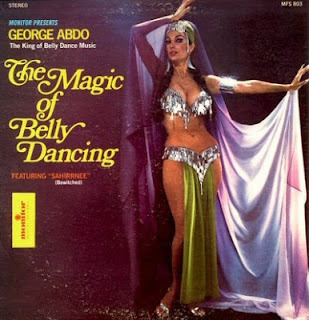 But more of a classically trained dancer who took up the belly dancing aesthetic. In watching these videos I tend to agree with her.